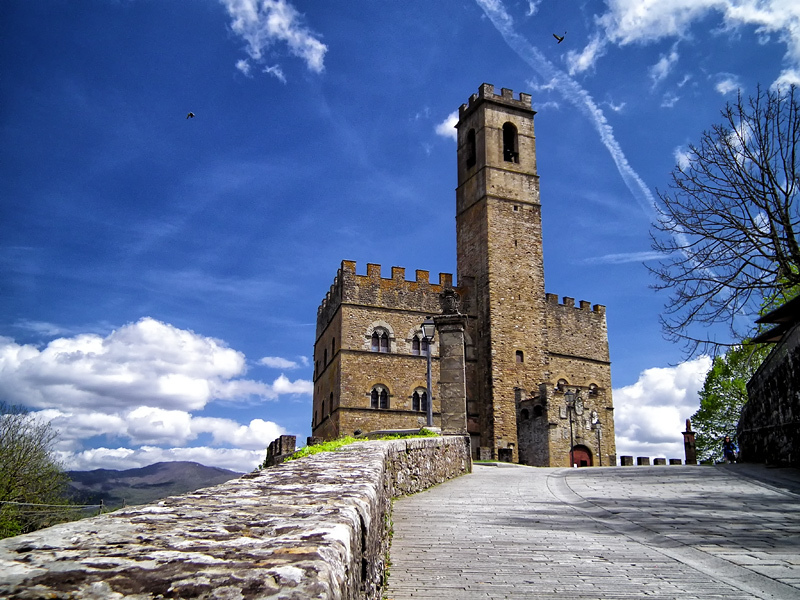 The Poppi Castle is the principal monument of Casentino. Contrary to other castles and Medieval architecture of the area, it has not been ruined by time or man. From the beginning of its origins it has been extremeley tied the largest feudal family of Casentino who placed Poppi on the center of its great estate and kept it this way for almost 400 years: The Guidi Counts. The original center point of the castle was made up of a square tower, that today stil dominates the rest of the construction and most of the skyline. Today's aspect is not primitive, in fact in the 1800's it was transformed and partially destroyed after being struck by lighting while going under reconstruction. The tower must have been much taller and complete with an apparatus that pointed out like spikes.If it was true then it probably was taken as an example from Arnolfo di Cambio for his work on the Palazzo Vecchio in Florence, luckily still intact. Four metres of the base are actually underground, keeping one from seeing the frame where the tower was, completely protected by the epoch's sealing techniques. The lack of openings present in the walls cause on to think that the walls are original. Then a fortified wall was built around the tower and additions were built on to it. The complex only had two doors. One was a large door facing the valley towards Ponte a Poppi with a steep access ramp and a smaller door on the opposite side towards the weapons plaza. After the great restoration of the castle in 1470, the afformentioned door became the principal entrance and was named Porta del Leone. The castle was expanded with the construction of a rectangular block placed to the right of the tower(looking from the weapons plaza). This was the makeshift jail house made with lower levels, comprised of a jail, depository and habitation. Even though today it is connected to the tower by a courtyard wall, originally the two constructions were seperate connected only by high level draw bridges, so that each could be individual and eventually be protection for eachother. In thegreat hall of the upperlevel of the jailhouse the Guidi counts rendered their accounts to the Florentine Republic in 1440. Almost contemporarily, the construction of the other wing of castle was started on the other side of the tower. This part was completed only to the first floor when the jailhouse was finished, which worked out because it gave way to an internal courtyard that can be admired still today, rich in stone coat of arms of the florentine family who later gave the vicariate to the castle.On the side of the castle facing Ponte a Poppi the courtyard is confined by the Chapel. A great part of this work must be attributed to Count Simone Guidi, author of the first great restruction that began in 1274, that raised the rank of the surrounding social residences. Another great work was carried out before 1470. 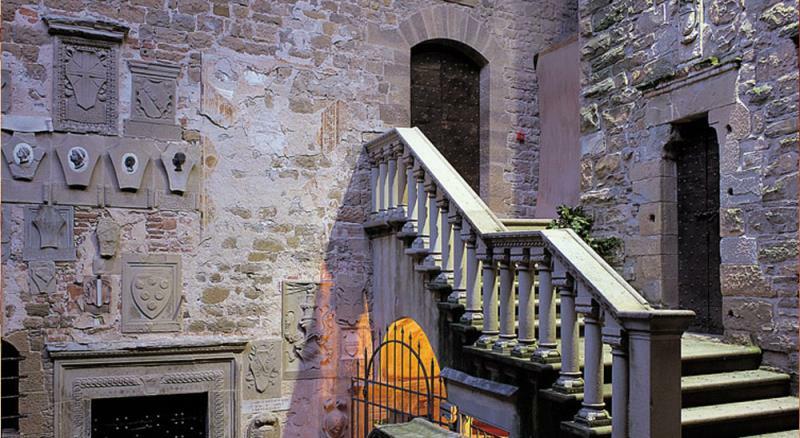 This was of great interest to the internal courtyard with the construction of a splendid stone staircase that gave access to the various floors of the building and the external stairwell.The floor plan was made for the seperation between the castle and the weapons plaza and a anti-door was constructed on the external frame which was practically a made to protect the inner door. The "Munition door" was also given a draw bridge that today does not exist. The castle was by then a beautiful residential palace. The latest restoration of this last century, with the remodelling of a series of ornamentation of the facade and the reconstruction of corners and other parts of the brickwork, gave the castle a splendid aspect.